Homemade salsa recipe with fresh tomatoes is the inspiration of branded Salsa is delicious and healthy as well. This recipe does not require any preservatives, food colors, flavor additives. Without compromising on the taste and the quality. My son always pulls a big bag of Tortilla chips and the huge bottle of salsa from the shelves of the stores. I really didn’t know, munching them always is good for health or not. But I’m 100 percent knows that homemade is always good and healthy compared to that of ‘ready to eat’ available in the stores. 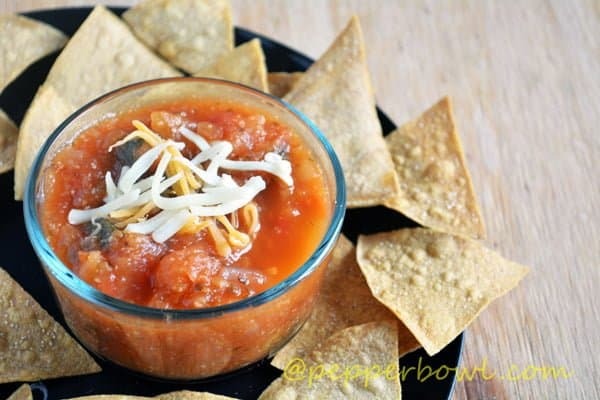 This Homemade salsa recipe with fresh tomatoes is good for health as we don’t add preservatives, food colors, flavor additives, But we are not compromising on the taste too. This recipe can be made in minutes with simple procedures and taste exactly like a branded one. The leftover can also be used as topping sauce for Pizzas. Now, we will plunge into the recipe. 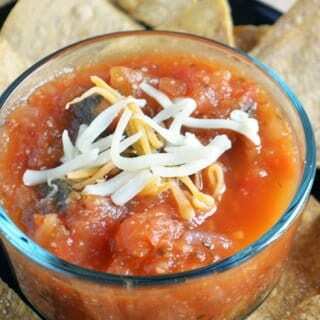 Best to serve homemade salsa recipe with fresh tomatoes along with tortilla chips. The tomatoes are sweet and juicy. We bought these garden-fresh tomatoes from our recent visit to local farm. Which is one of the popular organic farms in Pennsylvania. This farm claims that they are not using any harsh chemicals or pesticides for their plants. Maybe natural way of farming is the reason for these tomatoes to be delicious. We loved every bite furthermore we decided driving to the farm does worth its taste. Can homemade salsa with fresh tomatoes be frozen? Yes, the Homemade salsa with fresh tomatoes can be frozen in the sealed air tight container for the longer use. And it stays for months if stored properly. For thawing, there is no strict thumb rule. But if time permits, transfer the frozen salsa to the refrigerator a day before using. On the other hand, for instant use, you may also thaw it in the microwave. How to preserve homemade salsa? Canning or freezing are the ways to preserve salsa. Canning needs some strict rules to follow while Freezing is the user-friendly method. The only disadvantage of freezing is that the container occupies some space in your freezer. Other than this it has got no disadvantages. And absolutely, freezing is my most preferred method of storing their leftovers. How long is homemade salsa good for? This is great to consume within a day if stored on the kitchen counter. If it is in refrigerator it stays good for about 5 days. When frozen it lasts for months. This Homemade Mexican salsa with fresh tomatoes is best to pair with tacos, nachos, or tortilla chips. You may use the salsa as a base spread for pizzas. Or you may also use this salsa while making pasta. In this Homemade salsa recipe with fresh tomatoes I’m mentioning about farm-fresh tomatoes. I do not mean that this homemade salsa is possible with only the garden-fresh tomatoes. Both these tomatoes equally great for making this recipe. And that is no difference in the taste when using garden fresh or the store-bought tomatoes. Which Verity of tomato is best to make the salsa? You may use any type of tomato for this. Each verity brings up unique taste and they are astonishingly delicious. 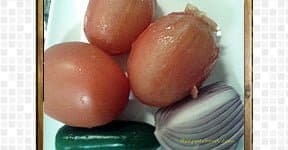 I made this Homemade salsa recipe with fresh tomatoes multiple times. But every time salsa tastes different because of the tomatoes I use. Firstly, we need to blanch tomatoes. Slightly slit the bottom of the tomatoes like shown in the picture. It makes it easy to peel off the skin. Cook 2 tomato to the boiling water for about 2 minutes. Then remove them from the water and allow it to get cool. Once cooled down, peel off the tomato skin. Due to the slit, we made earlier, we could easy to peel off the skin like peeling bananas. Dice 1 tomato, 1/4 onion, and jalapeno pepper(remove the seeds, if you want it mild hot). 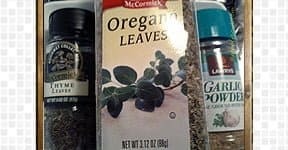 We need thyme, oregano leaves, and garlic powder. It is well and good if you have them fresh, otherwise also no issues. Puree peeled of tomatoes in the blender. 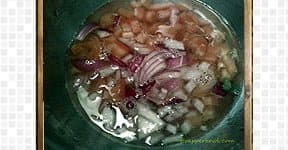 In a pot add 1/2 cup of water, add diced tomatoes and onion. Cook them till it becomes soft and tender. Add the tomato puree, salt, jalapenos, garlic powder, thyme , oregano leaves and cook it in the medium to high flame till you reach the thick or desired consistency. Bring this tomato mixer to room temperature, and transfer this is to serving bowl. 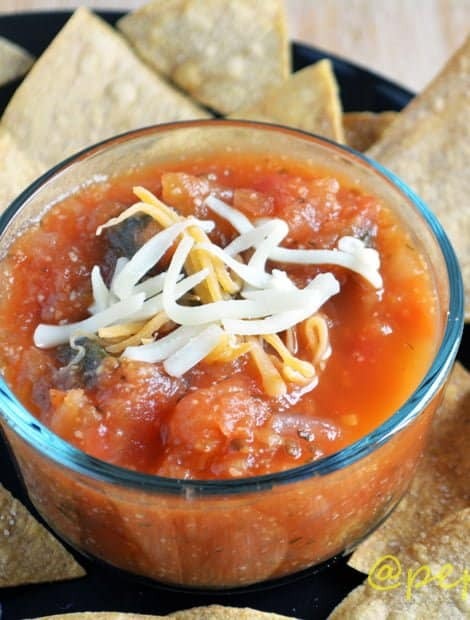 Homemade salsa recipe with fresh tomatoes with the inspiration of branded Salsa. This is delicious, healthy and does not require any preservatives, food colors, flavor additives without compromising on the quality. Blanch 2 tomato in the boiling water for about 2 minutes min. Peel off the tomato skin and puree it with the blender. Chop the remaining tomato, onion, and jalapeno. In a pot add water, chopped tomato, and onion. Now stir in tomato puree, jalapeno, garlic powder, thyme, oregano, and salt. Cook them until it reaches the desired consistency. Transfer salsa to the serving bowl. Love the home made salsa. BTW you should have make chips also home made.